We spent Sunday up to our elbows in bits of old print at the Ephemera Society's latest sale, and we picked out a few choice items. 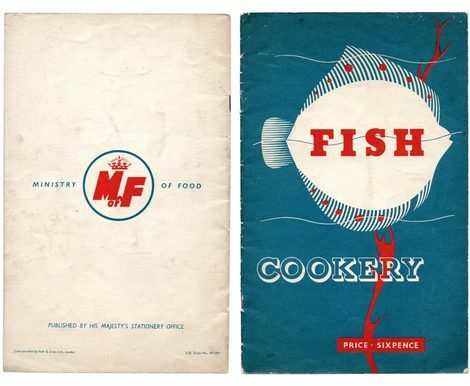 First up is this post-war (March 1948) cookery booklet from the Ministry of Food. We were taken by the simplicity of the cover, with a nice bit of Rockwell Shadow for 'Cookery', and the seaweed that might also be a flame. But, more than the front cover, we were taken by the back cover. Ministry of Food is a great name to begin with, and that logo is just bonkers. A bit cooler than the current Defra logo. We weren't quite so taken by the final recipe though – Fish and Cabbage Spread. Eeeurgh.